1. All fish must be caught during the specified dates of the tournament, March 31 – April 2, 2017. Entry fee is $697.68 plus $52.32 Florida sales tax for a total of $750.00. 2. All fish must be weighed in on the day they are caught. weigh in up to three fish per day not to exceed six fish for the tournament. 5. Tournament hours and dates are from 12:01 AM Friday, March 31, 2017 through 8:00 PM Saturday, April 2, 2017.
in Destin. Scales will be open from 4:00 PM until 8:00 PM each day. Thursday, March 30, 2017. The doors will open at 6:30 PM and dinner will be served at 7:00 PM. committee. All possible winnings will also be forfeited if the entrant refuses to take the required polygraph. boat to disqualification from the tournament without refund. 12. Any protest must be presented to the weigh-master within 24 hours of the weigh-in of the fish in question. invalid the protest will be forfeited. scrutiny of the committee. Their decision is final. entangling device will be disqualified. 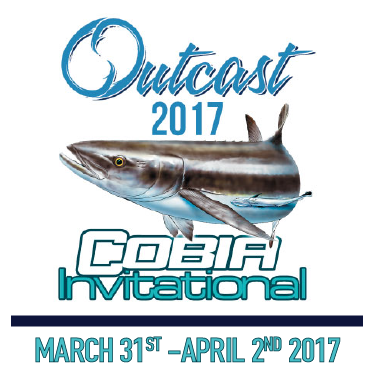 accompanied with the Official Tournament Entry Form to be eligible to participate in the Miller Lite Cobia Invitational. pending results of a polygraph test. 17. The use of HARPOONS is strictly prohibited. 18. Intentional snagging or foul hooking is prohibited. State regulations after the printing of this publication will be covered at the Captain’s meeting. ILLEGAL ENTRIES WILL BE ACCEPTED. to gut a fish will result in the disqualification of the fish in question. 20. Only one prize per boat per division this includes the optional cash awards categories as well. possession limits of all fish involved. 22. All rules are subject to change at the Captain’s meeting.